For assisting the school dropouts, belonging to the minority communities in the country, and also helping them in bagging sustainable jobs, the central government of India has launched a welfare system that is known as the Nai Manzil’ Scheme. All backward minority communities will be included under this welfare program. Education and skill training – Under the scheme, the department will make sure that all school dropouts, belonging to the minority groups not only get educational qualification but also receive occupational training that will assist them in the future. Tenure of the actual project – As per the announcement of the central government, the total term of the project has been fixed to be 5 years. During this time, all implementation related tasks will be done in well-defined phases. Providing placement – Once the trainees have been trained both at academic and vocational levels, the department will also assist in providing them with suitable placement to make the training fruitful. It has been estimated that around 70% trainees will get jobs from this initiative. Estimated number of candidates – With the implementation of the scheme, the government is expected to cater to the academic and vocational requirements of around 100,000 minority candidates. Duration of the training – The scheme will continue for 9 to 12 months. The duration will also include the skill training term. The term of skill training will not be more than 3 months. Bridge courses – The 8th and 10th standard level schooling will be provided via the distance education system. The development and implementation of Bridge Education System will be done for tackling this situation. Pilot project – As of now, the scheme has been implemented on a pilot basis in certain parts of the country. The government wants to learn more about the advantages and mistakes from the trail basis implementation. Stipend for the trainees – To encourage the minority groups in taking part in the scheme, the central government will be providing each individual with monetary grants on a monthly basis, during and after the completion of the training. Sensitization and awareness – Another interesting part of the scheme will include the efforts of the government to create awareness among the younger generation and assist them in acquiring better life skill trainings. Programme Implementing Agencies – The central government will send out invitations to such NGOs and agencies, who want to be a part of the scheme. These are known as Programme Implementing Agencies. They will get financial assistance aid from the central government. Must belong to minority community – It is an established fact that only the candidates who belong to any of the minority communities will be allowed to take part in the scheme. The minority dominated states and union territories will also be enrolled, provided they are not more than 5% of total seats. Must be of specific age – There is an age related criteria that the candidates will have to fulfill. They must fall within the age group of 17 to 35 years. Income related criteria – The scheme will assist in uplifting the condition of the minority youth of poor strata. Thus, all interested candidates must have the Below Poverty Level certificate to enroll. Seat related reservations – As per the guidelines, 15% of poor but non-minority candidates will be enrolled in the project. 5% of the total number of seats will be reserved for physically challenged people, while 15% seats will be reserved for female candidates. Criteria for the agencies – The NGOs and PIAa, which are interested in providing the academic and skill training, must be registered under the government. They also need to fulfill other criteria as laid down by the scheme. All interested candidate can check out the official website of the Minority Welfare Department to know more about the application process. Each candidate will have to fill in an application form, via online or offline process. They will also have to provide documents for verification process. Once the verification has been done, each candidate will be placed under the care of an agency that will be responsible for providing training to the candidate. “Free coaching scheme has been launched by government for for minority students . And Free Coaching Scheme Minority Students For Civil Service Exam Telangana has also been launched for minorities. Training by skilled experts – Under the scheme, only those agencies will be able to participate who will prove themselves worthy by showing that they have a positive track record. They need to have experts who will provide fruitful training to the candidates. Selecting the candidates – Once the application has been made by the interested applicants, the selection process will begin. The deserving candidates will be selected for being a part of the course. Placement opportunities – All the NGOs and PIAs must place at least 70% of the total candidates they have trained within a span of 3 months, after the successful completion of the course. MSDE norms must be followed – It has been stated that all activities, related to the curriculum of the scheme must be as per the rules and norms of the MSDE. It states that the candidates will be provided training as per the capabilities of the person. NSQF norms – The preparation of the training modules and syllabus will be done according to the guidelines laid down in the MES or the QP-NOS. It will assist the agencies in remaining within the NSQF norms. Developing communication with industries based locally – It is the responsibility of the PIAs to provide individual with jobs after the completion of the training. For this, they need to be in constant touch with all locally based industries to maximize chances of employment. Tracking the activities of the placed candidates – Apart from providing jobs and post-placement monetary grants, it will be the responsibility of the PIAs to track the activities of all candidates. If any of the candidates lose their job, the PIAs must find them another job. No fee will be charged from the students or the agencies for the training. The agencies, which want to be a part of the scheme, will be provided with a sum of Rs. 56,500 for every selected candidate. This will include the training expenses, supplies expenses, candidate grant expenses and others. The agencies will be given the money in three separate installments. The ratio of the installments will be 30:50:20. On the other hand, each selected candidate will be given a stipend to encourage participation and continuation of the training. The agencies will be responsible for the payment of this grant. The candidates will acquire a total amount of Rs. 18,500 as per stipend. It will include Rs. 1000 each month for a period of 6 months during academic training, Rs. 1,500 each month during the skill training. After the placement has been made, the candidate will acquire a grant of Rs. 2000 for a term of 2 months as post-placement grant. As per the announcement of the central government, they have already allotted a whopping amount of 50 million dollars. The money has been acquired from the World Bank. The Indian government will have 25 years to pay the credit back and an additional grace period of 5 years will be allotted for the assistance. But it has been estimated that the actual cost of implementing the project will be around 100 million dollars. In India there is a saying that if there is heaven on earth then it is Kashmir. Kashmir is a tourist place majorly covered with snow. And hence it is the prime attraction for tourists all over from the world. The basic traditional trade in Kashmir is embroidery on clothes and tourism. There majority population of Kashmir is the minority community. Due to lack of proper fiscal support the girl students have to leave the education and get into the traditional business. Hence to overcome this situation the Ministry of Minority Affairs has launched a new scheme “Nai Manzil”. They will be trained into various sectors for three months such as computers IT (software and hardware), Tourism/hospitality, saffron processing, food processing, embroidery, electronics and plumbing. After successful completion of the course the trainees will get Rs. 4500 as stipend. This scheme is already running successfully in Patna and Motihari in Bihar and Bhandup in Mumbai. Hence in near future we are going to encounter a skilled labour. Siddharth Kishore Dev Verman who is the Additional Secretary of Minority Affairs Ministry was happy to officially innaugrate the Nai Manzil Scheme in Guwahati. This scheme is targeted towards those students who have dropped out of school for any reason. Apart from encouragement to finish basic education, this scheme also offers vocational training to these young individuals. I am just interacting with a family who is not capable of providing education to their children . They have only a Tea Stall for running their livelihood ,running in front of HARSHA HOSPITAL, FAIZULLAGANJ ,LUCKNOW . I just approached them and talked abt giving education to their children and told about the the NAYI MANZIL YOJANA SCHEME for educating the minorities and also providing skill development training . They are willing to educate their children . This scheme very need full for Minority people.We are working in the field of development of Urdu Language etc. we interacting with families those are not capable to providing education for their children . Our Organization also working for poor and needy students for education. 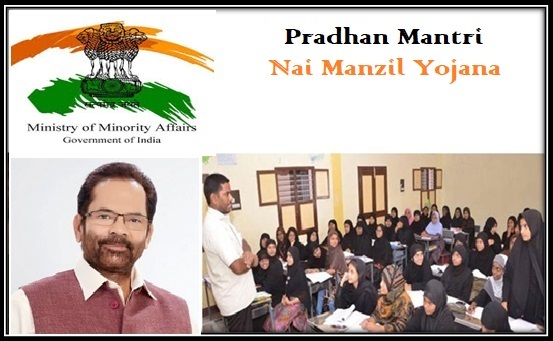 NAYI MANZIL YOJANA SCHEME giving support for educating the minorities and also providing skill development training. kindly suggest how can we help to proper implementation of “Nai Manzil” yojna in Madhya Pradesh. After submission of Inspection reports of Centers of Project Implementing Agencies of Nai Manzil and Seekho aur Kamao we, the Inspecting Authorities selected by Moulana Azad Education Foundation ,are in complete dark about the reports which were the results of thoroughly check and interaction with students and teachers/trainers attentively . Ministry of Minority Affairs should pay attention in this regard acknowledging the acceptance of inspection reports at least . sir I want work with Nai Manzil secheme as Agency . plz advised me . thanks you .